The snakes are back… but this time, they can turn right! And they don’t like you very much! 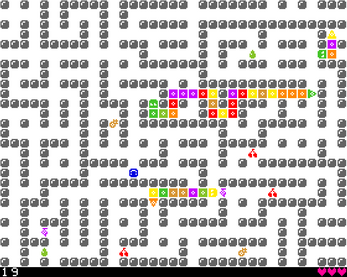 In this one, you’re a little blue smiley face, and you live in a randomly-generated loopy maze. 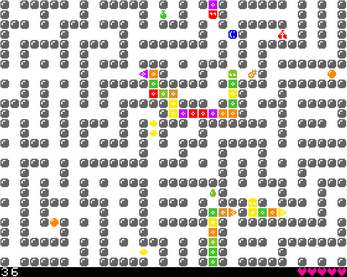 Snakes spawn from the edge of the screen and try to eat the fruits that materialize throughout the maze. But they also want to eat you! Try to survive for as long as possible, by hiding and running away from the snakes, as well as repositioning the fruits to hopefully distract them so they don’t eat you. You have two advantages over the snakes: (a) you’re faster than them, and (b) you can see where all the other snakes are. An individual snake doesn’t know where any of the other snakes are, so you can destroy snakes by causing them to run into each other. You get one point per segment of snake destroyed! Movement is Pacman-like: you'll keep moving until you run into a wall, but you can turn at any time. Press [SPACE] to start picking up fruits, and press [SPACE] again while carrying fruits to drop them. This is the first game I’ve made with a full-fledged AI, I think. That’s pretty cool. Also, the music is my own arrangement of Shostakovich’s Waltz No. 2 in C minor.